Hello ereodvbyy. My name is Snadyy and my daddy, Gnadard is ltnetig me wrtie tdaoy. My feinrd Wjodoa wotre and aeksd me to tlel you some tginhs aubot mlseyf. You will have to eucxse my wnitrig. My grmaamr and puciounttan are good but I hvae dfiuftcily sillepng. I dnot know who my real mmmay and daddy are basuece I never met them. I dont mind tohugh beuscae I lvoe Gandard and Gnanry vrey much. Tehy love me too and look aetfr me vrey wlel. My fuortaive game is tennis. Gadnard and I hvae gaert fun pnailyg tnenis, but he is gtniteg a bit old now so I dont ask to paly for too lnog. I ask for two or trehe short gaems a day ietasnd of one big one, so he can get his braeth bcak. I lvoe the car. Aiytmne Gadanrd divres awynerhe, he aaylws brngis me with him. I sit bisede him and give driiectons. Somtieems if he is terid or dnruk, he ltes me dirve. I lvoe taht. It is garet fun but it meaks peploe srate at me. I hvae a very good fenrid who lives up the lnae. She is celald Fizz. I see her as otefn as I can, but Garnadd keeps bnolckig my hole. It is the only tnhig I do not lkie auobt him. I hate luod niose. I hate it wehn there is tnuhedr or fokirewrs. Tehy mkae me feel all fnehtirged and dzizy and I hvae to hdie in a dark part of the husoe uitnl they stop. Gdanrad and Garnny mnid we very well thugoh and cofmort me when taht hnapeps. I am married to Bruno. He flowlos me aunrod all the time, and stemimeos I do not seapk to him. Flippin’ heck. That is so sweet. Dogs are great. Tummy scratches and inside-out ear rub to you Sandy. Ian – You’ll have to excuse Sandy. Not only is her spelling a little weak, but her claws need clipping. It doesn’t help. Try reading this. You’ll be amazed how well you do. I came across it some time ago when looking up info on dislexia. fi yuo cna raed tihs, yuo hvae a sgtrane mnid too Cna yuo raed tihs? Olny 55 plepoe out of 100 can. i cdnuolt blveiee taht I cluod aulaclty uesdnatnrd waht I was rdanieg. The phaonmneal pweor of the hmuan mnid, aoccdrnig to a rscheearch at Cmabrigde Uinervtisy, it dseno’t mtaetr in waht oerdr the ltteres in a wrod are, the olny iproamtnt tihng is taht the frsit and lsat ltteer be in the rghit pclae. The rset can be a taotl mses and you can sitll raed it whotuit a pboerlm. Tihs is bcuseae the huamn mnid deos not raed ervey lteter by istlef, but the wrod as a wlohe. Azanmig huh? yaeh and I awlyas tghuhot slpeling was ipmorantt! . I’ve tutored an adult with literacy problems, but tutoring dyslexics is probably best left to specialists who have studied courses for their vital work. Thank you Kairenhte. I tinhk Kenerthais are geart too. Tanhk you Tciftrmrhiainl. Taht was vrey nice. I lkie that. Sandy sounds like a great little dog. I love dogs with personality. I would have the Royal Hound write something. But he is afraid of the mouse. I keep trying to teach him the difference between a computer mouse and a live mouse. But he isn’t buying it. I enjoyed hearing all about you and also, your friend, Wouldye. I hope Bertie keeps his promise and drops you a line. Please tell Bruno that LoveBear shares his dislike of washing machines. Hi Snady. I izz Molly. I izz cat. You kk wiv catss? I izz not kk wiv dogs, but praps you izz diffrunt… I haz got sister. She izz Daisy, she izz poser cat. Don’t can jump laik propa cat – laik me. I izz speshul cat. Mine mom sez I can maybe haz got bulimia! Tanhk you all so much for wiintrg. A spcaeil hello to Dibs and Molly. I lkie cats. Tehy are fun, but tehy sipt a lot wihch is rude. I will psas that msgasee on to Bruno too. He is siltl a bit dizzy. Tanhk you eyenvroe. Now it is tmie for seelp. Sandy has buggered off to bed, so I have the puter back. Gerry – She told me to tell you that yours was the only sensible post she could read. Did your dog type that? Sinéad – I sometimes think she has too much personality. A dog with a wicked sense of humour can be difficult to like with. And I’m not joking! E Mum – Tell Bertie that lambs don’t taste nice without mint sauce. Cranky – Your Royal Hound is a wuss. Olga – The reason I haven’t been around is that I had to go into town. Sandy drove me there and back. She’s one of the safest drivers I know of. Roy – I tried that 🙂 It occurred to me after that Odiogo would have fun with it. It gave me a headache! Should I be worried that I understood that. I think. Awww…what a beauty! 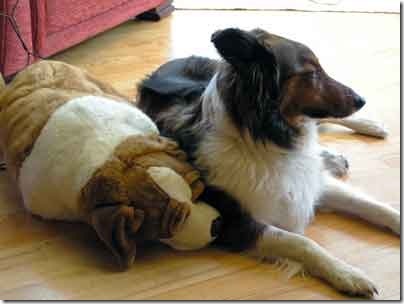 Reminds me of my girl…she was a border collie. She would freak out when ever she’d see something in the sky…hot air balloons were the worst! Sometimes it took me awhile to even find it in the sky to figure out what she was barking at! Bruno is the perfect partner, handsome, cuddly, cheap to feed and doesn’t say much! Great! Now this blog has gone to the dogs too. “Bruno is the perfect partner, handsome, cuddly, cheap to feed and doesn’t say much!”. Now where can I get me a Bruno??? No, seriously, I need a Bruno!! Charmed – I don’t know where Bruno came from. He just wandered in one day and hasn’t left since. He hasn’t even been out into the garden! Is it true that some pet dogs assume certain facial characteristics of their human owners? Now I’m never going to buy me a shaggy dog – it would be like looking into a mirror every time I met him and I’d be ashamed at the sight. That is a tricky one, Gerry. I know there is supposed to be a physical resemblance, but the only common characteristics we share are long straight hair, a lot of growth on our chins and beautiful eyes. My nose isn’t quite as long as hers and I don’t have a tail. She grins the odd time, but we all do that. Her expressions are all in the eyes, ears and body language. She just asked me for a game of tennis by pouting her nose, first at the tennis racket and then at the balls. She then gave a little ‘woof’ and rested her chin on my knee. [I won the game, by the way]. I don’t tend to use my ears too much to express myself. I bet she doesn’t woof woof like you do?